A leaking roof causes severe damage to ceilings and walls depending on the location and size of the leak. WHAT CAUSES TILED ROOFS TO LEAK? 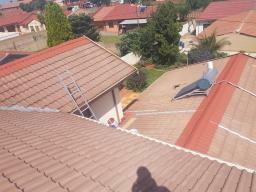 - Sagging roofs due to rotten brandering. Repairs are much cheaper than replacement. Whenever you notice that your roof is leaking, one should call an expert to come through for assessment. The expert should look for the causes of the leak then quote you. The expert should offer guarantee on his/her workmanship.